LUST CHERRY WHEAT IS TAPPED – PUT YOUR LIPS ON ONE! AS IT SHOULD BE, LUST IS OUR CHERRY WHEAT – A TRADITIONAL WHEAT, INFUSED WITH A MILD SWEET CHERRY. THIS BREW LAVISHES THE LIPS AND IS PERFECT FOR THE DAYS WE LUST FOR. The 7 Sins Brewery cherry wheat uses real cherry juice to flavor. Real ingredients. All the time. This beer is a refreshing, luscious craft beer perfect for summer. Lust is erubescent in color – a cherry copper that almost blushes. It comes in at a 9 on the SRM scale. Lust cherry wheat has a low bitterness (IBU of 10) and its ABV is only 4.2% – both of which make it easy to drink. At the same time, it is full of body and flavor and simply divine. All these qualities will quench your thirst for damned good craft beer. HEY, WHEN YOU GOT IT, YOU GOT IT. 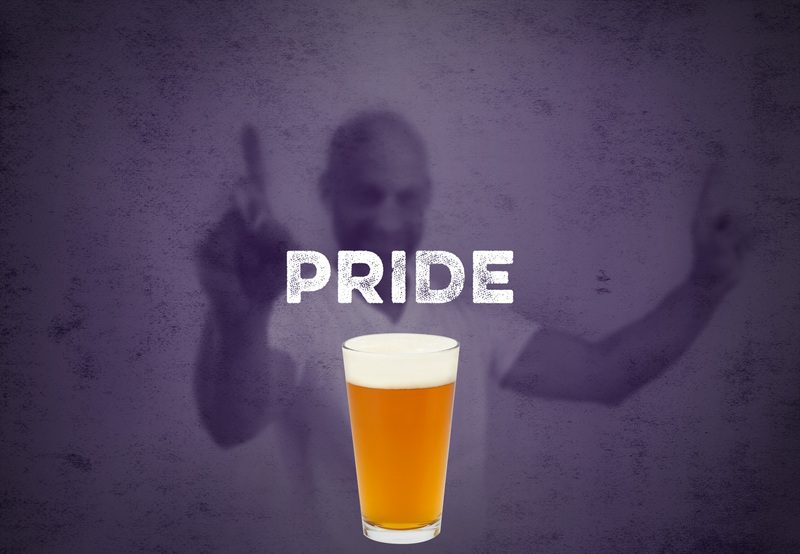 PRIDE, THE 7 SINS BLONDE LAGER IS SOMETHING TO BOAST ABOUT. IT HAS A LIGHT (ALMOST) SWEET, FRUITY FLAVOR AND IS BABIED THROUGHOUT THE BREWING PROCESS, KEPT AT A PRECISE TEMPERATURE. NEW TO BEER. NEW TO CRAFT BREWS. OR NOT. THIS LIGHT LAGER MAKES US ALL PROUD. The 7 Sins Brewery Pilsner is made right. In a world of ales including IPAs, stouts and sours, we have heard the Pilsner is on its way to the craft brew market with 7 Sins Brewery’s Pride sure to lead the pack! One ingredient that makes it a pilsner is the yeast – ours is brewed with a German Lager yeast (instead of an ale yeast like many other craft beers). And yes, it does taste like a refreshing, thirst-quenching American beer, as it should. Being hand-crafted by our head brewer, Bear, it also has a craft beer feel with layers of flavor and lots of depth. Try it yourself and you will agree. It stands alone. Pride is a brilliant golden blonde color – right at 4 on the SRM scale. It has less alcohol content than most craft beers yet, more than your everyday beer at 4.8%. Again, in true pilsner fashion it is not as bitter as some beer styles – just bitter enough to make it a BEER at 26 IBU. Pride has a fruity nose and (almost) sweet flavor with a light body. Finally, Pride has a velvety finish – offering a fresh experience to your day.